Nick Ansell / PA Archive/Press Association ImagesYour new boss. 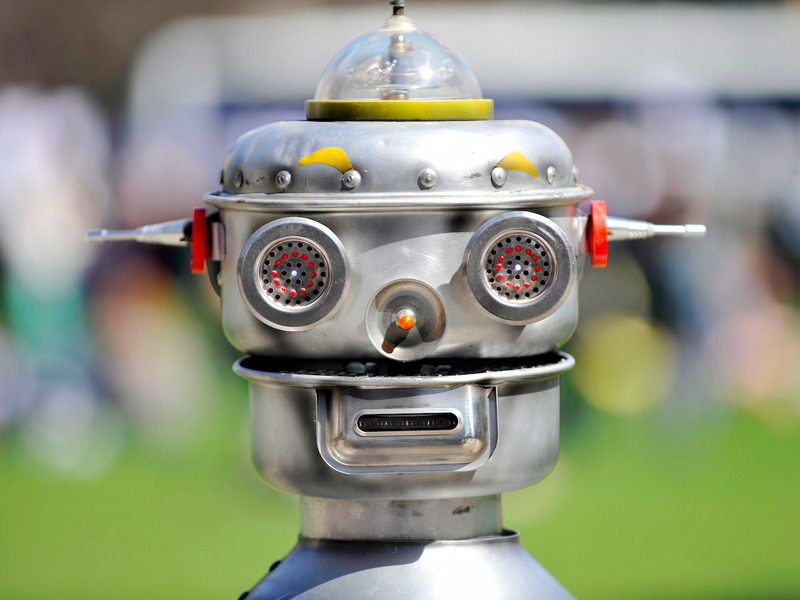 There is no need to worry about whether robots might start taking our jobs. It’s already happening. 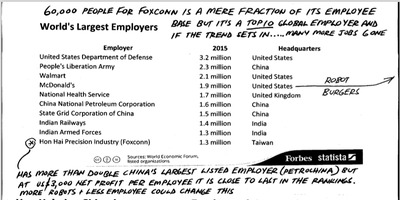 • Foxconn, a key manufacturing partner for Apple, Google and Amazon, is the world’s 10th largest employer and it has already replaced 60,000 workers with robots, according to a recent note written in part by analyst John Seagrim at CLSA. • Walmart, the third-largest global employer with 2.1 million workers, wants to replace its warehouse stock-checkers with flying drones that can scan miles of shelves in a fraction of the time. • And the US Department of Defence, the No.1 global employer, is already ;flying the world’s largest fleet of unmanned aerial vehicles — drones, basically — in its various Middle East conflicts. The US DoD has at least 7,362 RQ-11 Ravens in operation for instance. Of those 10, only the UK’s National Health Service — with its massive army of doctors and nurses doing unrepetitive, unique tasks — looks like hostile territory for robots. The other nine are rich with rote, repetitive tasks that might be better performed by software. • Citi and Oxford University predict that 77% of all jobs in China are at risk from automation. • 57% of jobs across the 34 OECD countries are at risk of automation, according to Citi and Oxford. • The World Economic Forum has predicted that 5 million jobs could be destroyed globally by 2020. • IBM claims it has created a computer that is better at diagnosing cancer than a human, for example. • Even journalism is not immune — the Associated Press is already using AI software to write up company results. The vision of mass unemployment created by robots isn’t a guarantee, of course. The optimistic vision of a robotic future is one where our mechanical helpers allow us to work 4-day weeks by slashing the workload, leaving us to spend most of our time in the pub or in front of the TV (let’s be honest). 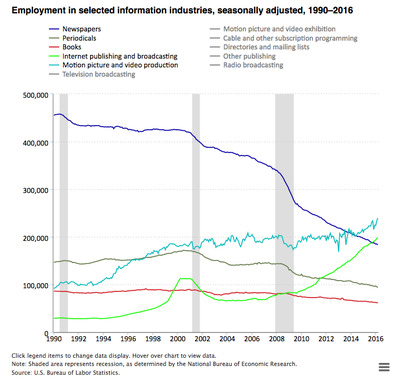 New technology tends to create more jobs than it destroys — every robot worker will need a maker, a manager, and a maintenance person. The Citi report warned that “the benefits of technological change are not being widely shared,” and says advances in automation and robotics are likely to exacerbate the gulf between the 1% and the 99%. There’s no doubt that the opportunity for businesses to reinvent themselves. But the societal impact of that can be — will be — huge. There’s a good and a bad version of that. 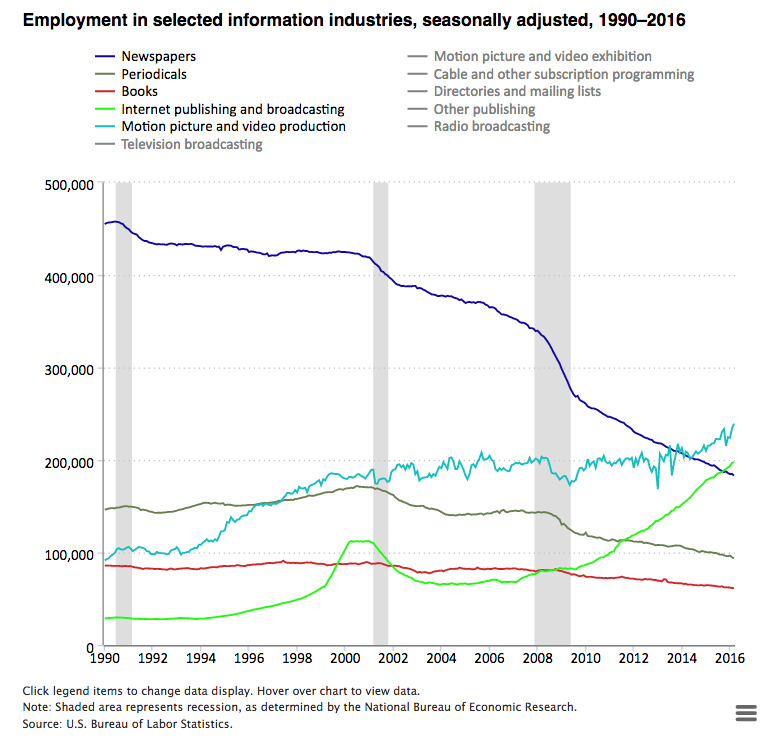 The bad version is one where we bet everything on that digital infrastructure and yet it’s not secure, we don’t know what privacy is, and jobs get killed faster than we create new ones. Then this digital revolution will just be an ordinary revolution. People won’t accept the fact that there’s no longer a need for them. The good version of this is one where we begin to steer the innovation towards a path where we use the opportunity to get independent limited resources — we stop climate change, we empower 4 billion people who are today not connected to the world. The optimistic vision sounds very optimistic and, unfortunately for everyone, it looks like the pessimistic vision is so far making better progress than its rival — particularly in China. Twenty-five per cent of all the world’s robots!McDonald’s, which employs 1.9 million people to Walmart’s 2.1 million, could even embrace the robot. McDonald’s, which employs 1.9 million people could even embrace the robot. McDonald’s chief executive Ed Rensi told Fox Business that if minimum wage in the US rose, the fast-food chain would consider robots, according to CSLA’s Seagrim. “It’s cheaper to buy a $35,000 robotic arm than it is to hire an employee who is inefficient making $15 an hour bagging French fries,” he told the broadcaster. Wikimedia CommonsNedd Ludd, the leader of 19th century machine breakers the Luddites. 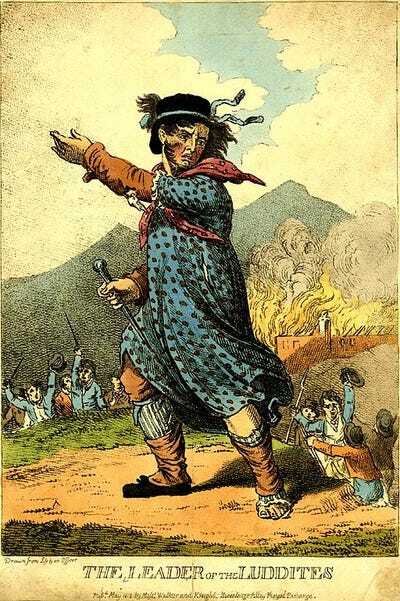 Seagrim starts his note by referencing the Luddites, the machine breakers of 19th century England, quoting the incredible fact that: “In 1811 more British soldiers were deployed fighting Ned Ludd and his army of unemployed textile workers in the North of England than were engaged fighting Napoleon in Spain!” Clearly machines stealing jobs is not a new phenomenon. That may be great in theory but as WEF’s Snabe points out, humans need a concerted and conscious effort from businesses to include them rather than just focusing on the bottom line. He told the conference: “The societal impact is huge and I think we have an opportunity and an obligation as business leaders to think in that direction rather than simply optimising for the next quarter. What are we going to do to make sure there are relevant jobs — they will be different jobs — for the future.